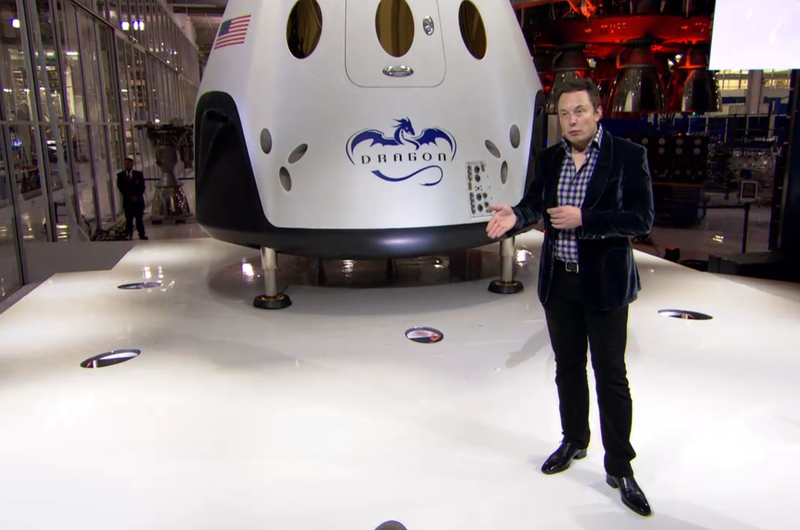 SpaceX is gearing up to be the first private company to bring an astronaut to Earth’s orbit with the Dragon V2, an updated version of its Dragon spaceship that would make space travel safer and more controlled for its crew. A rendering of the Dragon V2 landing with its new type of thrusters. Photo courtesy of SpaceX. The V2 will be capable of carrying seven astronauts and the first manned flight is planned for 2017 or 2018, when it would bring astronauts to the International Space Station. It can dock with the ISS autonomously or piloted. The V2 is similar in design to the Dragon capsule that SpaceX currently uses to ferry supplies from its Falcon 9 rocket to the ISS. But it incorporates a set of thrusters that would allow astronauts to separate their portion of the capsule from the ship if something were to go wrong. The thrusters, which passed qualification testing this week, also allow the ship to land on Earth or another planet. The thrusters’ engine was made in part with a 3D printer that prints in metal. The V2 can be reused as soon as it is refueled. It can lose up to two engines and still land safely. Musk said the inside of the craft was designed to be clean. Touch screens replaced the mass of wires and buttons that past spacecraft designs have prepared us to expect. 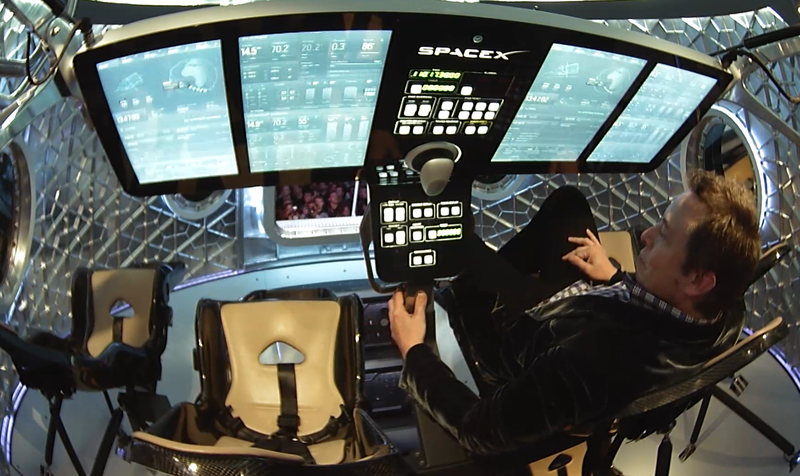 At one point, Musk stepped inside the V2 displayed on stage and reclined in the pilot’s chair. 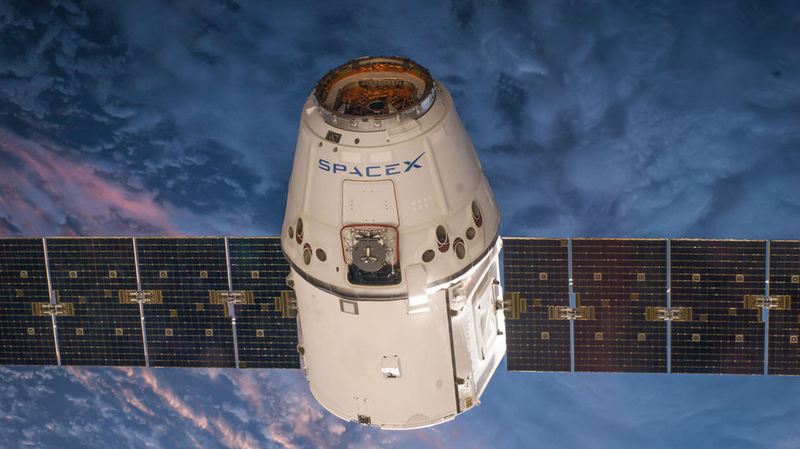 The original Dragon cemented its place in history in 2012 when it became the first privately owned spacecraft to deliver goods to the ISS. So far, it has completed three trips to the ISS. SpaceX built it with the intention of someday using it to ferry astronauts to the ISS, though a manned trip has not yet been attempted. The original SpaceX Dragon capsule. Photo courtesy of SpaceX. The update comes on the heels of NASA’s crumbling relationship with Russia, which had been flying American astronauts to the ISS after the shuttering of the U.S. shuttle program. NASA currently plans to focus on space exploration and leave cargo and ferry missions to private companies like SpaceX, Orbital Sciences and Boeing. SpaceX currently has more than 50 planned missions. Okay, I give them credit, but it does look toyish and flimsy. it seems to be working with supplies so test it with a dummy first, then a chimp or some kind of animal. For the dummy I recommend Obama or Pelosi or Reed. Any one of them will do or maybe perhaps all all three to make sure it can carry at least three dummies. Someday, there will be a statue of this man somewhere. If not many places. Wish I was educated enough to be an astronaut. Flying is wonderful. The first private company to put an astronaut in space was Scaled Composites in 2004. 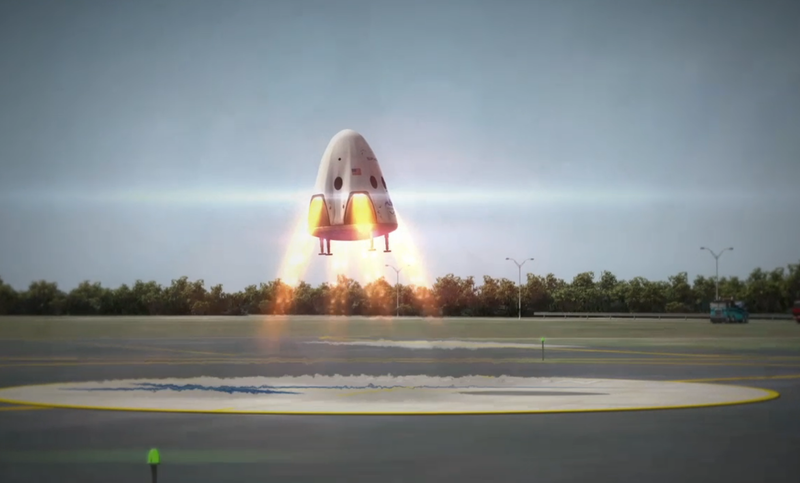 SpaceX has a shot at being the first private company to put an astronaut into orbit. Good point. I have updated the story. I really hope they succeed with manned flights in 2017 and 2018. That will open up a lot of opportunities for travel beyond the ISS. Really love seeing the space age coming to fruition. Nice site design and excellent reporting as usual Gigaom.